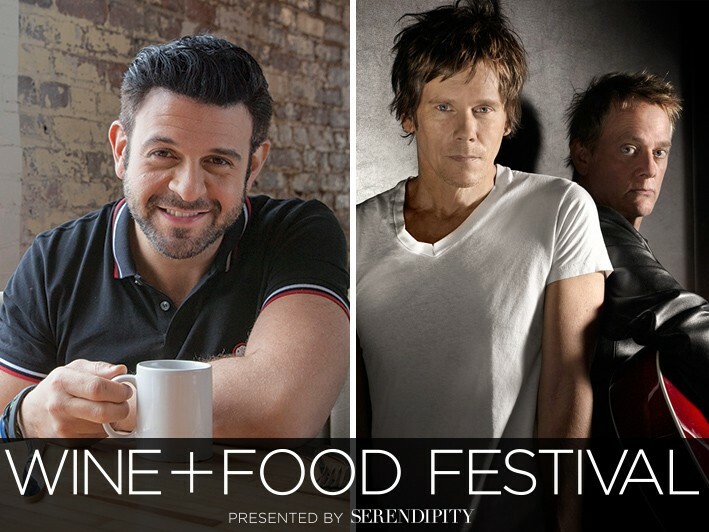 Friday Master Chef Dinner with Adam Richman & The Bacon Brothers - ACT FAST - Limited Number of Tickets Available! Hosted by celebrity chef Adam Richman, this unforgettable night brings together inventive dishes and live music for a not-to-miss evening! Flavors meld, pans sizzle and guests mingle while the Serendipity’s 2016 Most Innovative Chefs and the Festival Ambassador Chefs prepare creative cuisine along the water’s edge. Guests will enjoy exquisite wines, beers & cocktails, as well as Festival official tote bag and wine glass. The evening will conclude with a live musical performance by The Bacon Brothers. After purchase, you'll receive an email with a printable certificate, buyers will need to bring this certificate to the event Will Call window (on the day of the event at Roger Sherman Baldwin Park) to validate the purchase and gain entry. Disclaimer: Rain or shine we will dine! Must be 21 or older to attend all festival events. No dogs – no animals. Infants and strollers prohibited. All events, prices, personalities, performances, venues, dates and times subject to change without notice. No refunds or exchanges. The Greenwich WINE+FOOD Festival urges all adults to consume alcoholic products responsibly. TICKETS ARE NON-REFUNDABLE. Price of ticket includes 10% CT Admission Tax. Greenwich WINE+FOOD is a national, premier destination event featuring world-renowned chefs, wine / spirits producers, & musicians! • Rain or shine we will dine! • After purchase, you'll receive an email with a printable certificate, buyers will need to bring this certificate to the event Will Call window (on the day of the event at Roger Sherman Baldwin Park) to validate the purchase and gain entry. • These is a one-time event. Certificates expire on 9/23/16.